Adam Kubert is a legendary comic artist. Over the course of his career his works have appeared in DC, Marvel, and Dark Horse Comics. His works feature the characters we all know and love from Superman, Spider-man, Wolverine, Ultimate X-men, Ultimate Fantastic Four, and Ghost rider to the Incredible Hulk he produces some of the most vivid work in the business. 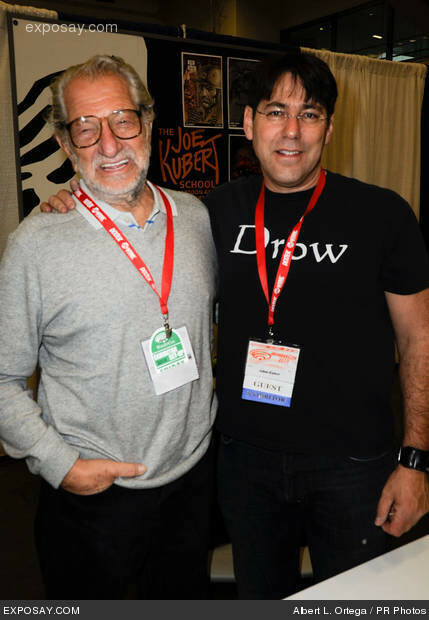 He teaches at the Joe Kubert School of alongside his father Joe and brother Andy (who is also an illustrator). Wizard magazine has called him one of the “Hot 10 Writers and Artists” in the industry. He won an Eisner Award for his work alongside his brother Andy,inking the title Batman: Batman vs Predator. What were you like as a kid? What would you say is your fondest early memory? My earliest memory was popping a wheelie all the up my driveway on my Honda SL70…those were the days. What is it like to come from a family that is so creative? Your father must be very proud? Yeah…he seems to be. As far as a creative family, I don’t really know any other so to me this is normal. What did you draw most as a child? Catsup faces on my hamburger. You got a job as a letterer at age 12. What was it like to do that? Again, this is what I knew so it didn’t feel weird in any way. Just a way to make enough money to buy that SL70! Did you feel lucky to have the job at such an early age? Hmm…I don’t know but it felt pretty good being able to buy what I wanted instead of having to ask for it. Is it true you were the youngest professional comic book letterer? As far as I knew, yes. Since this is a publication catering mainly to horror/sci fi/dark fantasy, are you yourself a fan of those genres? Which works speak to you most? Do you have a favorite..monster so to speak? I have four favorite monsters…they are my four children. What is your scariest memory to date? When I was a kid we had traveled to Mexico. My two brothers and I went out into the ocean with one raft. Trouble was that there was a tremendous rip tide and before we knew it were way way out there… and couldn’t get back in. I remember seeing my Dad with his hands cupped by his mouth but we couldn’t hear him because we were so far away. They sent some surfers to bring us back in. It wasn’t until we were safely on the beach that we found out there were a lot of sharks out there. You have a degree in medical illustration. What led you to that? I enjoyed drawing and I liked science so I put the two together. Plus it was the only program that I was accepted into. Do you ever think you might go back to that? When you started working on Batman vs Predator did you ever think you’d win an Eisner Award for it in 1992? What did it feel like when you first learned of that? I remember Diana Schutz called me the next day and gave me the news….she said she was proud of me but not all that keen to go up in front of a gazillion people to accept it. I was pretty stoked to win it… Andy still kids me about winning the best tracer award. What it is like to work with your father and brother? Do you find it helps to work with people you know best? I love working with both Andy and my Dad. I know whenever we work together that the job is going to come out great. What do you think you’d of become if not an artist? A hobo. I love to travel. I’m working on the last issue of Astonishing Spider-Man Wolverine…written by Jason Aaron…and LOVING it! Yes…I try not to take what I do for granted. I realize what I have and know that I’m very, very lucky. I don’t feel like it’s work…and for that I’m forever grateful. Thanks for the genes, Dad (smiles).